CM Magazine Profile: Jill MacLean. 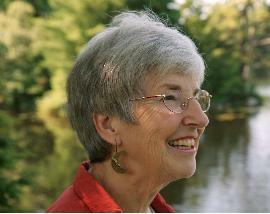 Jill MacLean was born in Berkshire, England, on February 27, 1941. "We lived about 30 miles west of London, so gas masks, bomb shelters, the black-out, and rationing were all part of life. A woman from St. John's sent us packages during the war; I was entranced by the little yellow boxes of Chiclets. Years later, my mother was able to meet her and thank her. My father was an aeronautical engineer who didn't get drafted because his company manufactured aeroplanes for the war. Five years after the end of the war, he was posted to Nova Scotia, where the same company had contracted to repair the navy planes at Shearwater, the Canadian Forces base outside of Dartmouth." "I was nine when we moved to Nova Scotia, and for me, it was a big adventure. I loved Canada from the beginning. Sliced bread. Velveeta cheese. Driving for miles and seeing only trees. I went to school in Dartmouth, and then to university at Dalhousie. My plan had been to go to McGill in Montreal and study physiotherapy. But by then, my mother had had her first stroke; my sister, who was six years my senior, had already left home; and it was understood that I would stay home. I went to Dal for an honours biology degree. Because I've always been interested in the outdoors, in retrospect I wish my degree had emphasized native flora and fauna and been more environmentally oriented. But those specialties weren't available then. Consequently, I have a much more standard biology degree." "For a while, I thought of studying medicine. When I look back, and we're talking the 1950s, there was an enormous, unspoken pressure that, as a young woman, you went to university and you got married. I wasn't rebellious in those days, I didn't question the status quo, and two years after I graduated, I got married." Jill says that, as a child "before I left England, I was determined I wasn't going to grow up to be a girl. I must have figured it out pretty early that you had more freedom and more opportunities as a boy � even if they were only opportunities to stay out half an hour later after dinner. I was also determined to learn to fly. In England, we had this stone wall in our garden by the willow tree, and I used to leap off it and think, 'If I just do this right, I'll be flying.' Those were my two earliest plans, neither of which � not surprisingly � worked out." "I remember writing a book while I was still in England. I remember the pictures, and my big, loopy handwriting. I bound it with string. It was about a swan. We used to punt on the Thames, and the swans were extremely bad-tempered. Then, in high school, I can recall two stories I wrote. Each time, I wrote something I really cared about, and took time and trouble over it. Both times, the teacher wrote at the top, 'Is this original?' I would have a very different reaction now. But back then, I simply detached myself. 'Oh well, there's no point writing what I care about. I'll just write any old thing.' While I was at Dal in the Hons. Biology program, we had to take two English courses. When a professor from the English department asked if I would like to do Hons. English, I declined. I sometimes wonder what would have happened if I had taken English. Who knows?" "I've always loved to read, even as a kid. For a long time, we had no television. You either read or listened to the radio. Good training for a writer! In England, I used to read Enid Blyton. When we moved to Canada, I read a lot of animal books, like Walter Farley's 'The Black Stallion' series, Eric Knight's Lassie and Marguerite Henry's Misty of Chincoteague. And I still love Winnie the Pooh. In fact, when I was pregnant with our first child, I remember driving up to Cape Breton with my husband. He had given me all four of the Winnie-the-Pooh books, and I read him some of my favourite parts, such as Winnie saying to Piglet that he knew one of his paws was his right paw and one was his left, if only he knew where to begin." "I find Milne's sense of humour delightful, nor, to my mind, do his books talk down to kids. They use big words, and nobody makes a fuss about it. You either figure it out or you ask. In my own writing for children, I've never liked to feel that I'm writing down to my audience." Jill's early work history drew upon her biology degree: she was a lab technician at the Fisheries Research Board and at Dalhousie, Mount Allison, and the pathology departments of two hospitals. Later, she wrote for Harlequin Enterprises, an experience she describes as "a very useful apprenticeship. I learned what a novel was about, and I learned a lot about the mechanics." Oddly enough, Jill's writing for juveniles came about through her poetry for adults. From 2000-2003, she lived in Winnipeg. "I was writing poetry when I moved out there. George Amabile was the Poet in Residence at the Winnipeg Public Library. I got up my courage, submitted some poems, and was heartened to receive excellent feedback. When his term came to an end, I summoned more courage and asked, 'Could we continue?' 'Absolutely,' he replied. I only discovered George was the poetry editor at Signature Editions when he said to me, 'You have a book here,' to which I responded, 'No, no, George.' 'Oh yes,' he said, and that's how The Brevity of Red came to be published in 2003." "When I moved back to Halifax, we had a second launch for The Brevity of Red. My family came, including my grandson, Stuart, then nine. I had written one poem in the book for Stuart, and I read it at the launch. About a month later, he asked if I would write him a book. It had to have hockey and skidoos in it. I said, 'Of course I will.' I was very blithe saying yes. I know where the blue line is, although I'm not sure what it's there for; I don't like snowmobiles; and yet I'd promised to write a book about hockey and snowmobiles." "A friend of mine heads up the children's section of the Halifax Regional Library. I asked her, 'Can you give me a list of children's books I should read before I start writing?' One of the books on her list was Virginia Euwer Wolff's Make Lemonade, written in free verse. Of course, at that time I was immersed in poetry. I loved so many things about that book � the voice and its immediacy, the fact that you never knew what race the protagonist was and that it didn't matter. The book was realistic, gritty, hopeful, funny at times, and moving. I knew then that I had to do the very best I could with this book I'd promised my grandson. Obviously I read a lot more books, but that one made a big, big impression, so much so that when Prinny (in my second kids' book) was having difficulties with reading, I used Make Lemonade as a guide along the way." "That first children's book felt like a whole new venture, and the learning curve was steep. Although I must have drawn on what I'd learned from the Harlequins, I made some major errors, and the initial manuscript was quite a bit shorter than the book that eventually appeared. I self-published four or five copies of this early draft because I wanted to give my grandson Stuart a copy while he was still young enough to enjoy it." "A couple of my friends had read the early version, and they thought it was brilliant. I, too, thought it was brilliant, so I sent it out. The publisher, however, did not think it was brilliant. My first rejection � and in the manner of rejections, it hurt. My next step was to give the manuscript to Norene Smiley, who for years organized 'Word on the Street' in Halifax, and who was a real expert on 'kidlit.` After she'd read it, we went out for breakfast. 'Your book goes like this,' she said, using her hands to describe a series of little humps. 'You come across a difficulty, and you fix it, and you come across a difficulty, and you fix it. The book's got to go like this,' and in the air she inscribed a straight line heading upward at a sharp angle. It was the best advice I ever received." "The root of the problem was that � unconsciously � I'd written a 'nice', gentle book for my grandson because I didn't want to upset him. After I'd spoken to Norene, I realized I had to free the book from Stuart. I was still writing the book for him, but I had to totally detach it from him and allow Travis his own adventures and misadventures. If Travis got into trouble, he had to get into real trouble and find his own way out of it." "The version that I self-published is about half the length of the final book. I didn't add any more characters. It was more a question of digging deeper. Don McKay, a Canadian poet, that's his advice. If a poem isn't working, dig deeper." "I did a lot of rewriting, editing, and shifting around. During this time, I attended Humber College's week-long workshop, 'Writing for Children,' a wonderful experience. My mentor there was kind enough to read the whole manuscript, even though it wasn't in her job description! She suggested the ending wasn't dramatic enough, and she was right. So I rewrote that, as well." "I'm met two agents at Humber. I sent my manuscript off to one, who gave me some good editorial advice and eventually turned me down. As I say to students when I do school visits, 'If you want to be a writer, you have to get used to the R word: Rejection.' Easier said than done. However, each time I sent the manuscript out, it was getting stronger." Some positive reinforcement came via Brian Bartlett, a poet friend of Jill's. "Brian was reading the manuscript at night to Josh, his son, who would have been maybe 10 at the time. Brian told me how Josh would sneak the flashlight under the covers and read the next two chapters when he was supposed to be asleep. Then, the next morning, he'd say to Brian, 'You've got to catch up, Dad.' Here was an actual flesh and blood kid enjoying the book!" "Encouraged, I sent the book out to another publisher, who sent me the nicest rejection letter I will ever receive. Earlier, the agent had told me Fitzhenry & Whiteside was accepting unsolicited manuscripts, so next I sent it to them. Almost immediately, they emailed me, 'We have to show it to the publisher, but we think you're on.'" I was, of course, enormously excited." 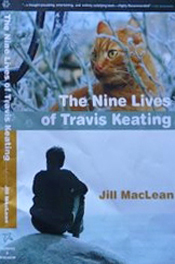 "The Nine Lives of Travis Keating was published by Fitzhenry & Whiteside in 2008. My grandson came to the launch, carrying a big bunch of flowers. Not bad for a fourteen-year-old!" "While I'd been waiting to hear from the various publishers about Travis, I'd started writing Prinny Murphy's story. 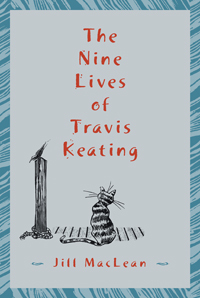 Ann Featherstone, my wonderful editor at Fitzhenry & Whiteside, later told me that when she was editing The Nine Lives of Travis Keating, she thought at one point Prinny was going to take over the story. That didn't happen. But Prinny really interested me. When Fitzhenry accepted my first book, I was able to tell them I had the sequel, The Present Tense of Prinny Murphy, already written. That's how why the two books came out so fast, one in 2008 and one in 2009." Jill's says plan after The Present Tense of Prinny Murphy was not to write Home Truths but to write Hud's story. "Fitzhenry suggested the third book of a trilogy can't be young adult when the other two books are for middle readers because the books would end up in different sections of bookstores and libraries. They were, of course, absolutely right. Very politely, they added, 'Change the name and change the setting.' My initial reaction? 'Over my dead body!' In all honesty (and this probably sounds pretentious), I grieved the fact that I couldn't write Hud's story. He was very real to me." "Time passed, until, by some mysterious alchemy, Brick MacAvoy appeared. He lives on Hilchey River Road on the Eastern Shore of Nova Scotia, and like Hud, he's a bully whose father is also a bully. But Brick is very much his own person, with his own voice. 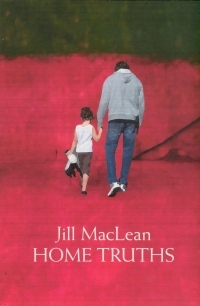 In some ways, it was liberating to write Home Truths as a stand-alone book and not as part of a trilogy where I had to worry about the continuity and so many interlinked threads. I was free to go where I wanted; and a host of new characters, residents of Hilchey River Road, very quickly emerged." "Nevertheless, I found Home Truths a hard book to write and harder still to edit. When I first sent it to Ann Featherstone, I had made a startlingly obvious mistake in the timing. And so, of course, I had to do some major rewriting � which, as usual, made the book better. The moral pivot of the book is near the end where, instead of moving in for the kill in his fight with his father, Brick stands back and lets Floyd defeat himself. If I'd written Home Truths as an adult novel, I would have written it from two points of view, Brick's and Floyd's." "The Present Tense of Prinny Murphy almost wrote itself, but with The Nine Lives of Travis Keating and Home Truths, there were a lot of rewrites." "I definitely write character-driven fiction. I begin by brooding, a long period of brooding, like a hen sitting on an egg (we kept hens during the war). I want to know as much as I can about the backgrounds, certainly of the protagonist, but also of the other characters. I always need a sense of what the 'tipping point' will be, what crisis or shift will send the protagonist into a tailspin. My writing method, such as it is, is to put characters together in a certain setting, introduce a tipping point to stir the pot, and see what happens. Because I never know quite what will happen, the process is one of discovery." "During the brooding phase, the characters start talking to each other, and scenes appear that are infused with energy. I write all this down in a big unlined notebook. I dislike lines. Too tidy. When I begin writing the book, I rarely refer to these notes: they've served their purpose." Asked how she knows when it's time to move from the 'brooding' stage to putting things down on paper, Jill replies, "'When I start vacuuming the apartment!'" (her least favourite domestic chore). "Less facetiously, the pressure builds to sit down at the computer and actually start writing. Very often, the 'beginning' isn't the beginning. The beginning of Home Truths was rewritten many times. Originally, I had a much softer first scene. But Brick is a bully and bullies bully, so the final version begins with a bullying scene." "I write in scenes. I can't write in chapters. When a scene gets underway, I have to keep going until it's finished. I can't seem to stop midway and say, 'Oh, I need a chapter break here.` So after the book's written, I have to go back and divide it into chapters; this doesn't always work out, and can be frustrating." "I write five days a week, generally mornings only, though the morning can last until 2 p.m. The next day, I begin by rereading the previous days' pages. Sometimes I reach a point and realize, 'I really don't know where I'm going here. I'd better read everything I've written so far' because I don't particularly want to go way the heck over here and then find out, 'Oops, I should have gone over there.' This is when I walk outdoors a lot, carrying a notebook, hopefully not muttering to myself as I wait for inspiration to strike." "I edit as I go, and tend to write fairly tightly. The latter practice can make a major rewrite difficult, because the various threads of the story are so intricately interwoven. And finally, I print each day's work as well as save it on three memory sticks, one of which I carry with me wherever I go (yes, I'm paranoid)." "When the first draft is finished, I start revising. That wonderful pile of paper! Revising, for me, is a process of getting to know what I've written, and of deepening my knowledge of character and place, until both are absolutely real to me. " "After The Nine Lives of Travis Keating was published, I was traveling to an outport on the south coast of Newfoundland when this kid got on the coastal boat. I looked at him and thought, 'That's Travis!' I later met the boy. It was bizarre. I couldn't be comfortable with him because I wanted to call him Travis and ask how Felix the cat was doing. That's another thing. On the covers of my books, I don't really want the characters facing the reader because I feel that limits the reader's imagination. Besides, the characters on the covers could never look the way I picture them. And yet I couldn't tell you how I picture them. I just 'know' how." "If the characters have a life after the book is over, they certainly have a life while the books are being written, and often demand to have 'their' way with the plot. "In The Nine Lives of Travis Keating, I wanted Travis to start feeding the cats right away. But, no, he didn't want to. There was too much other crap in his life, and he wasn't going to get involved with those cats." "I love Newfoundland. Colin, my RCMP son, and his family lived on the island for 18 years, and I used to visit several times a year. Two of the major themes in The Nine Lives of Travis Keating emerged from my times on The Rock. After Colin was in Stephenville NL, he and the family were posted to Moncton NB, where Stuart met a boy called Daniel. They clicked, and so did both sets of parents. However, 11 months later, Colin was sent to St. Anthony in northern Newfoundland. It was difficult for Stuart. It's also difficult as a parent or grandparent to watch your kids or grandkids suffering and know you can't fix it. So that's why the 'tipping point` for Travis comes when he leaves St. John's and moves to the little community of Ratchet on the northern peninsula. The second theme evolved from my stay 13 years ago in an outport on the south coast of Newfoundland. A colony of feral cats lived under the wharf. There was no road and no store, and the nearest vet was 150 km away. I never forgot those cats, and they came to mind when I was 'brooding' over the book. I've always lived with (I never like to say 'owned`) cats, strays who've turned up on the doorstep." "Since Stuart had requested hockey, I read some of Roy MacGregor's books in his "Screech Owl" series. Not in a million years could I achieve what he did. This guy knows hockey from the inside out. Luckily, my son coaches hockey. I'd watch my grandson play and ask questions, listening for the telling detail � like 'the five-hole`. While Prinny was just an observer at games, Travis actually played. I hope I covered the hockey angle ok. For Prinny's story, I read about alcoholism and reading difficulties, because (as with Brick) I didn't want to solve her problems too easily." "For Home Truths, the setting was no problem: I already knew Nova Scotia's Eastern Shore well. Karate is one of the themes in the book. The sensei of a local karate club gave me permission to attend some beginner classes, where I watched and took notes (I tried some of the moves in the privacy of my apartment � one of those times you wish you were twenty years younger!). I also watched videos and read about the philosophy behind karate. I sent the sensei the 20-25 pages that dealt with karate, which he was kind enough to read. He pointed out that Brick was learning the karate moves too quickly, nor would he have the strength for a lot of the punches. So I had to emphasize more self-defense, knee strikes and elbow strikes, and cut back on the actual karate in order that the book be realistic." A theme running through Jill's books is that of loneliness and loners. She explains, "I read a book of interviews by Writers and Company's Eleanor Wachtel, and any number of the writers talked about feeling like an outsider. I moved from one country to another country, and I don't have the family roots of so many Maritimers. As an adolescent in school, I didn't fit in at all. I was what kids today might call a 'loser'. For instance, my mother insisted on keeping me in lisle stockings when all the other kids were wearing nylons, disallowing my desperate need to blend in. I wouldn't want to be a teenager again for anything." "I married a clergyman, which can be socially isolating in rural Cape Breton congregations. Writing for Harlequin wasn't your average occupation. People either say, 'How fascinating!' or 'How can you sell your soul like that?' Writing poetry isn't high on most people's lists. And my hard-earned Masters of Theological Studies is a real conversation stopper. In other words, I've often felt like an outsider. Then, when my daughter died in a car accident, I discovered what existential aloneness means. Nobody can fix that kind of grief. You're alone with it, even though simultaneously very grateful for friends and loved ones and family: a paradox, and paradox is so often what poetry's all about." "There's loss in everybody's life. A book without loss in it would be, for me, unrealistic. Another belief of mine is redemption. I have to believe we can change for the better in some way, or else what's the point? In my children's books, I deal with kids who struggle to discover where they belong, and to grow comfortable in their own skins." "I was a member of a wonderful poetry group throughout the nineties. They were all published poets, some with several books. I learned a lot about critiquing because they were both honest and respectful. I've never been in a group before where you argue about, 'Should there be a "the"? Or should there not be a "the"?' I loved it." "I don't have a writing group for my juvenile novels. I never let anybody see a manuscript until I've finished the first draft and have done some serious editing of my own. And I never talk about a book while I'm writing it. It's too amorphous for one thing. Plus it takes a lot of energy to write a novel. Talk is easy, and writing isn't. So I would have to go to a group with a complete manuscript, which is tricky when you only meet once or twice a month." "I believe we write out of our own experiences. How can we not? Hopefully, the experience has gone 'deep' enough that it's transformed when we write about it. I've come across books of poetry and memoirs that I felt were written too soon after a traumatic event. The event hadn't been sufficiently assimilated. It's rather like compost. You have to let the mix sit and heat, until it turns into rich, dark brown humus. Otherwise, you're just getting vegetable scraps. I guess that's one of my theories of writing � the compost theory. I've been a gardener most of my life." "Writing the Harlequins was a good apprenticeship in terms of dialogue, setting, pacing, character, plot, and so on. Poetry, which has been defined as 'the least number of best words', is an excellent discipline because it guards against over-writing. I'd far rather have the power of suggestion than too much explanation. Over the years, I've received two pieces of advice from poets. Don McKay has said 'Dig deeper`; and Fred Cogswell, commenting about some of my execrable early poetry, advised, 'Cut.' The Nobel-winning Irish poet Seamus Heaney uses wonderfully muscular verbs and nouns. I try and emulate him by using lots of good Anglo-Saxon words and not too many Latinate. This, to me, seems to suit the vividness of a kid's world." "All of a sudden last year, I realized I'd written three books about bullies. I didn't want to get in a rut. needed a new challenge. So my fourth book, my second for young adults, is a novel written in free verse. Verse seemed to fit both the theme (which is not bullying) and the protagonist, whose name is Nix Humbolt. The working title, which I hope will end up being the title, is Nix Minus One. And yes, it's been a challenge. I don't see how I could have known the opportunities and difficulties of a free verse novel without actually writing one. There's no place to hide: that's one of my discoveries. I've nearly finished revising, and hope to send the book out in the next month." The Nine Lives of Travis Keating. Fitzhenry & Whiteside, 2008. Grades 3-7. The Present Tense of Prinny Murphy. Fitzhenry & Whiteside, 2009. Grades 4-8. Home Truths. Dancing Cat Books, 2010. Grades 6-9. This article is based on an interview conducted in Halifax, NS, on October 18, 2010, and revised October, 2011.